Macintyres Gift Card	There are 7 products. Not sure what to give for that special occasion? Give the gift of Macintyres with one of our convenient Gift Cards. Each card comes in an attractive presentation wallet with a blank envelope for ease of use. The gift cards are redeemable in-store only, can be topped up at any time. and expire 24 months from purchase or last top up date. 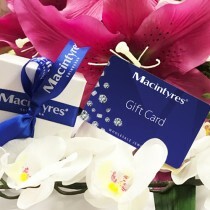 £10 gift voucher for Macintyres of Edinburgh. Vouchers are redeemable in store only. Not sure what to give for that special occasion? 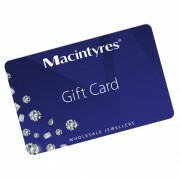 Give the gift of Macintyres with one of our convenient Gift Cards. Each card comes in an attractive presentation wallet with a blank envelope for ease of use. This £500 card is redeemable in-store only and includes VAT. It can be topped up at any time and expires 24 months from purchase or last top up. Not sure what to give for that special occasion? Give the gift of Macintyres with one of our convenient Gift Cards. Each card comes in an attractive presentation wallet with a blank envelope for ease of use. This £250 card is redeemable in-store only and includes VAT. It can be topped up at any time and expires 24 months from purchase or last top up. Not sure what to give for that special occasion? Give the gift of Macintyres with one of our convenient Gift Cards. Each card comes in an attractive presentation wallet with a blank envelope for ease of use. This £1,000 card is redeemable in-store only and includes VAT. It can be topped up at any time and expires 24 months from purchase or last top up. Not sure what to give for that special occasion? Give the gift of Macintyres with one of our convenient Gift Cards. Each card comes in an attractive presentation wallet with a blank envelope for ease of use. This £50 card is redeemable in-store only and includes VAT. It can be topped up at any time and expires 24 months from purchase or last top up. Not sure what to give for that special occasion? Give the gift of Macintyres with one of our convenient Gift Cards. Each card comes in an attractive presentation wallet with a blank envelope for ease of use. This £100 card is redeemable in-store only and includes VAT. It can be topped up at any time and expires 24 months from purchase or last top up.